Dfly & Flyght go together like peanut butter & jelly. Cookies & milk. Cat & cow. Like indoor cycling & disco balls. That’s why we are introducing the Dragonfly/Flyght COMBO Pass! 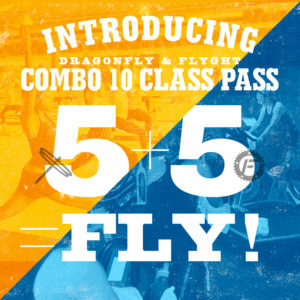 Now you can purchase a Dfly/Flyght 10 Class Combo Pass for $150 – that’s 5 passes for Dfly and 5 passes for Flyght, a $20 savings over purchasing them separately! You get the *BEST* of both worlds and we get to see your smiling face at Dfly and Flyght! These special passes are only available for purchase in person. Stop by any Flyght or Dragonfly location today!